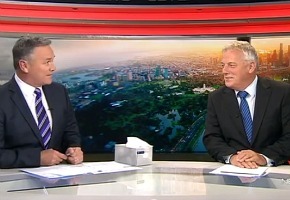 Seven sports presenter Sandy Roberts had his final Seven News bulletin last night in Melbourne, after 33 years with the network. Roberts has been with Seven News Melbourne for eight years, but has decades of covering sports events for the network including Summer and Winter Olympics, AFL, NBL, the Australian Open, Spring Racing Carnival and major golf tournaments. He leaves to join FOX Footy. “There’s probably a line to follow that but we won’t go there,” Roberts quipped. “Can I just thank the viewers because without them we’re nothing? We’ve done so much over so many years whether it’s the children’s hospital, grand finals or Olympics Games, tennis or golf, they’ve been fantastic. Today Tonight also paid tribute to his years on the network. A stellar career. It will be interesting to see if he still comes back to Seven for some events like the golf. Personally, I hope he does, but can’t see it happening. @steviem I think when Seven first re-gained AFL broadcasting rights in 2007, Sandy wasn’t interested in calling AFL, but now he is and there’s no spot at Seven for him. @StevieM it could be argued the PR spin probably was the real reason! New Generation of fans… Blah blah! Look fwd to his great work continuing. The TT story I think really showed his passion for AFL and wanting to be on air again TV wise. Will still be calling for Crocmedia. He will prove himself to be a well used asset when some of the regular Foxtel crew do the Glasgow Comm Games. (Eg Eddie, Jason, Gerard and Dwayne). He should never have been over looked for AFL coverage on 7. Farewell from Seven Sandy. The HSV newsroom just won’t be the same without you! And neither will Seven’s Sport coverage. But we look forward to your great footy insights on Fox Footy in 2014. Sandy is a legend! He is Australia’s best AFL caller and it is so good that he’ll hopefully be back calling games on Fox Footy! Can’t wait!